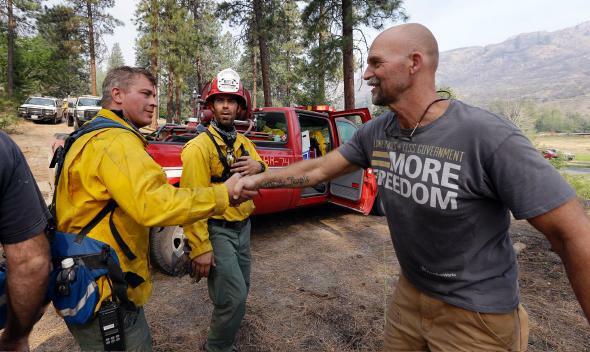 Less government = more freedom t-shirt, firefighters thanked: Washington state site of irony. Brad Craig and firefighters in Okanogan, Washington on Saturday. 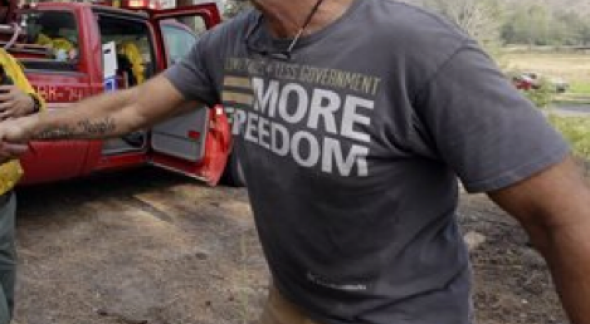 The shirt says “Lower Taxes + Less Government = More Freedom.” You can buy one here on the site of the FreedomWorks Tea Party organization. In a related matter, 10 different government organizations are mentioned in the AP story about the large-scale coordinated response that worked to Craig’s benefit. More than 1,000 people are involved in fighting fires in the Okanogan area, the AP says. Update, 11:25 a.m.: To be clear, I understand that FreedomWorks has not literally called for the elimination of public fire departments. (If it did, it wouldn’t be the first time that proposal has been made by a libertarian group or activist.) FreedomWorks has, however, opposed funding for federal disaster relief funding of the sort that Washington state has requested and received from FEMA to fight ongoing fires in the Okanogan area. FEMA also paid for more than $2 million in fire-related infrastructure repairs in Okanogan County in 2014.